Tongue in cheek... Junk dog food or meatless diets can cause allergies, diarrhea, urinary infections, and thyroid problems; all of which veterinarians treat. Thursday, I went to the doctor with Poison Ivy outbreak and along with some ointment, he put me on a prescription diet of corn chips, which has proven most convenient! He sells them right there; the corn chip company not only funded his education but still keeps him up to date regarding healthy nutrition. These corn chips are so very tasty that I can't eat enough of them, thus won't miss all that cooking and grocery shopping and his practice also makes a nice profit selling the chips. Sorry, perennially healthy people: These prescription corn chips are available only through doctors! Far fetched? Not really. Just this week when I had my dog in again for diarrhea, thyroid symptoms and chronic skin infections, I was telling my vets about crazy "Internet People" saying they had completely healed their chronically ailing pets themselves by spending a fortune on "Those Fancy Dog Foods" loaded with MEAT when we all know that "feeding tests have proven" carnivorous mammals much prefer the taste of corn, glutens, peanut hulls, restaurant grease, sawdust, soy mill run and cheap melamine filler from China! My carnivorous companion animals are plump and pleasant and overall very HAPPY on their special prescription diets. One dog even tolerates dreaded car rides because he knows he'll get his special treats when we go to the veterinarian for his inflamed bowels, diarrhea, throwing up, urinary tract infections, and potential bladder stone removal! I'm taking another of my little carnivores along for his chronic itching, vomiting, and a hypothyroidism blood re-test, so obviously I'm far too busy to be scouring the Web reading "Stuff" by "Those Internet People." As a side note, these things (hyperthyroidism, bowel issues, urinary tract infections) must be contagious as my pets keep catching them from each other just when one dog's this-or-that might be healing! I've considered quarantining although the Vets say "it's pretty common" and it's not like it's a bloody tumor, intestinal growths, seizures, and/or kidney-liver failure, (yet) so I feel better. I really get a kick out of my little carnivores' fangy-looking teeth and the weird way they are shaped. I do wonder just why they are shaped that way instead of like cows' and horses' teeth but maybe I misunderstood what I learned in Biology Class. Considering the Veterinary profession has had much more schooling than I have and has apparently totally forgotten as well, I'm not too embarrassed. Some of "Those Internet People" are actually DVMs and have written books such as "The New Animal Doctor's Answer Book"; and the brand new "Not Fit For A Dog! The TRUTH About Manufactured Cat and Dog Food" and other such "silly stuff" of which the vast majority has no clue. Here's a sampling: A Dr. Michael W. Fox has a lot of secret cure information and research unknown to the vast majority, which would no doubt include my vets. Although this Dr. Fox writes a syndicated newspaper column in The Real World, his healing secrets will probably remain secrets to The Vast Majority because he's not Michael J. Fox. About junk food related diseases, Dr. Fox says: "... the ten most common claims of over 6,400 medical conditions... reveals a high incidence of the most probable 'junk food' related diseases... "For dogs: Ear infection; Stomach inflammation; Skin irritation; Tumors/growths; Skin infection/hot spots; Urinary tract infection; Osteoarthritis; Hypothyroidism; Inflammation of the intestinal tract; Soft tissue trauma. "As for the contribution of highly processed commercial diets to the sickness and suffering of cats and dogs, the fact remains that animals often make spectacular recoveries, not when put on special prescription diets, but when taken off all such 'junk' convenience foods, and are instead fed balanced diets appropriate for their species (e.g. no cereal-based diets for carnivorous...) - Michael W. Fox, B. Vet. Med., Ph.D., D.Sc., M.R.C.V.S." Check these Harvard Law Paper  questions because I doubt anyone today knows the answers! "a. Canid, mammal in the order Carnivora (Canine): Ground Whole Grain Corn, Powdered Cellulose, Peanut Hulls, Chickenby-product Meal, Chicken Liver Flavor, Soybean Meal, Soybean Mill Run, Dried Egg Product, Soybean Oil, Corn Gluten Meal... preserved with BHT, BHA and Ethoxyquin. b. Felid, obligatory carnivorous species (Feline): Ground Whole Grain Corn, Pork Fat (preserved with mixed tocopherols and citric acid), Chicken By-Product Meal, Soybean and Corn Gluten Meal, Soybean Mill Run, Chicken Liver Flavor, Calcium Sulfate, Dried Egg Product, Soybean Oil..."
3) Can anybody cite any actual MEDICINE in these "prescription formulas"? Then how veterinary clinics possibly justify the PRICE -- as much as $75.00-- which naive clients shell out, especially when comparing the INGREDIENTS side-by-side with those in bargain brands? How many pet owners are aware that eating these things is what actually causes the most common ailments and diseases in our companion animals? Don't they know that a carnivore's dentition and digestive systems do not permit efficient processing of grains and vegetable matter (let alone the inexplicable "things" listed above) -- Can anyone deny this? Would we consider it ethical if our family physician had a comparable "relationship" with the Snack Food Industry and convinced everybody that corn chip prescription diets were necessary - while they profited from the corn chip sales, as well as drug company perks for additional medications sold to mask the ailments resulting from such a strict diet? Would we accept this as we unhesitatingly do for our chronically ailing, over-drugged companion animals. 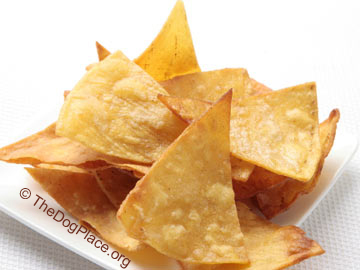 Naive companion animal owners are told by trusted veterinarians that their pets "need" to ingest these "special" foods (like corn (tough to digest), soy and wheat) which are among the most common, proven causes of allergies and other health issues in dogs and cats. Oh, and guess who are among the biggest stockholders in the companies that make the pet foods most often seen in veterinary lobbies? And only TheDogPlace.org has warned us?! I had to find it all out after having learned it the hard way because virtually everybody who should be alerting companion animal owners to this scam is invariably tied to, and profits from, the Commercial Pet Food Industry. Unlike Physicians, Veterinarians only have to answer to their own governing body which incidentally, is largely funded by the Commercial Pet Food Industry. So guess who gets to "teach" our Veterinarians about NUTRITION? And should we be thanking Mainstream Media for alert, prompt reporting and headlines which WOULD have prevented confusion, heartbreak and sparing of countless companion animals from easily preventable ailments, diseases and premature deaths? Signed ~ Deceived and Defrauded Companion Animal Owners! 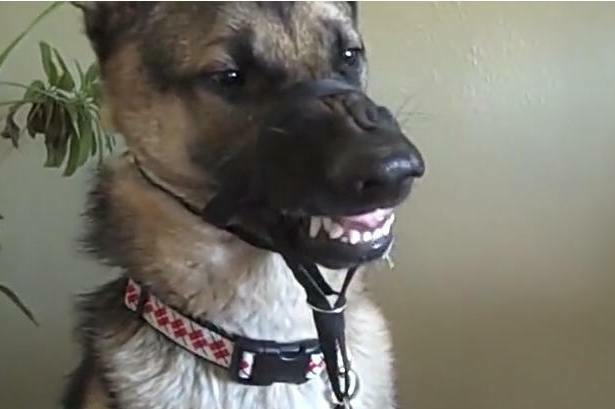 For more on canine nutrition, see Protein Deficiency Myth, display links below and for more on teeth, check out VIDEOS in Video Theater on Teeth Cleaning. 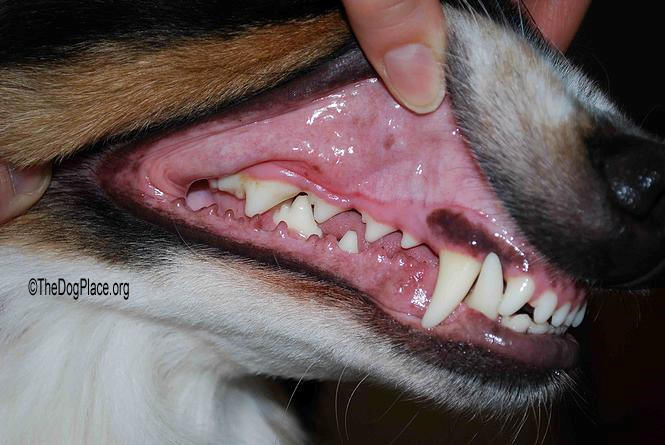 Why dental disease can be very dangerous for your dog! Some pet food companies think corn replaces meat protein. 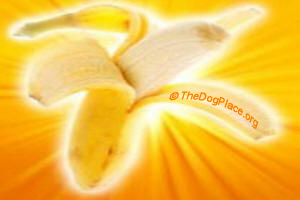 Do dogs like bananas? Good for a dog's healthy brain and yours!